Superboy is the name of several fictional characters that have been published by DC Comics, most of them youthful incarnations of Superman. These characters have also been the main characters of four ongoing Superboy comic book series published by DC. The first, and arguably best-known, Superboy was simply Superman as a boy, acting as a superhero in Smallville, where Kal-El (Superboy's Kryptonian name) lives under his secret identity, Clark Kent. 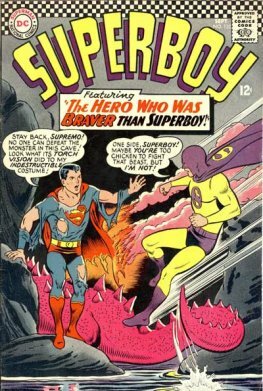 The character was featured in several series from the 1940s until the 1980s, with long runs appearing in Adventure Comics and two eponymous series, Superboy and The New Adventures of Superboy. He developed a mythos and supporting cast of his own, including foster parents Ma and Pa Kent, love interest Lana Lang, and time traveling allies the Legion of Super-Heroes. When DC Comics rewrote much of its continuity in 1986, Superman's history was changed so that he never took a costumed identity until adulthood, erasing Superboy from the canonical history of Superman, although many aspects of the backstory created in Superboy comics, such as Clark's friendship with Lana Lang, remained. 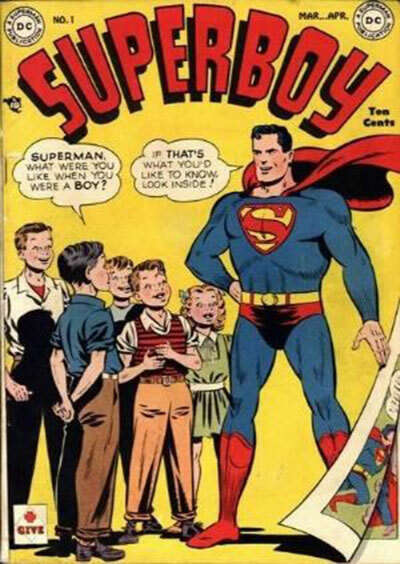 In the last few years, some additional features of Superboy's history, such as his tenure in the Legion, have also been reintroduced into the story of Superman's youth. The character was adapted into a Superboy television series (1988–1992), which also spawned another, short-lived Superboy comic book series; and a teenage Clark Kent, secretly using his powers in heroic acts, appeared in the highly successful Smallville TV series (2001–2011), drawing to a great extent on the comic book continuity in its depiction of young Clark's life. In 1993, DC introduced a new, modernized Superboy, a teenage clone of both Superman and Lex Luthor, also known by his Kryptonian name Kon-El and his secret identity as Clark's cousin Conner Kent. The new Superboy was featured in his own series, Superboy (volume 3), from 1994 until 2002, and in several series devoted to teenage superhero groups. He was featured in DC's relaunch of Adventure Comics and got his own series again in November 2010, which ran until August 2011. A revised version of Kon-El, complete with a new origin, debuted in a new Superboy series as part of DC's New 52 launch in September 2011. This Superboy made his Smallville debut on Friday, March 4, 2011 in the episode "Scion." In this episode (as in the comics), Conner is a clone made up of both Lex Luthor and Clark Kent's DNA, and has several of Superman's powers. Superboy is also featured in the animated series Young Justice that ran from 2011 to 2013. Due to DC Comics’ complex Multiverse, several other Superboys have appeared over time, with the most notable being the mentally unstable Superboy-Prime, a parallel world version of Kal-El.